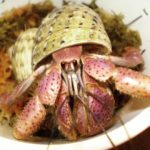 do hermit crabs hibernate during certain times? also, when is mating season for hermit crabs? i really need to know. Hermit crabs don’t hibernate. They can go into a similar state if the temperature and humidity is too low and stays that way for long periods of time. That can be very dangerous for them and it can kill them. Also, hermit crabs will breed in captivity but only if conditions are ideal. Only a handful of people have been successful with captive breeding. It takes a lot of time and effort and can get very expensive. okay. all my humidity is OK and so is the temp so he might be sleeping. and i would still like to know when breeding season is, not people telling me that i cant breed my crabs, because somethings i just want to know. thank you, that is all. Breeding season in captivity is whenever they want it to be. I was not telling you you can’t breed your crabs. I’m just saying it’s very difficult and only a handful of people have been able to achieve it. okay. how many offspring ussually survive? As far as I am aware only two or three people have been successful at getting them onto land. From what I read it's an extremely time consuming process with multiple water changes a day, keeping water conditions perfect and multiple feedings. Since it is extremely rare there are no real guide on how to properly care for them. It's mostly trial and error and changing things with every attempt to get better and better. Just getting crabs to lay eggs is difficult, you need almost perfect conditions for the crabs. They also need to lay the eggs in the saltwater not fresh. If they do drop them in the fresh the eggs die. Mary Akers had two a successful breedings last fall. I believe out of the thousands she started off with she currently has around 200 on land. She has tried many times before but was not successful until this time. Here is a link to her attempts. It's pretty amazing feat just short of a miracle to achieve this. GotButterflies also attempted to raise them several times as well. Here's a link to her progress. Curlz and NatAddictedToHcs did it too, in Germany and Australia. I think so yeah, their breeding diaries should still be here on the forum? where? i would like to see it! sounds hard to do if only a few people have accomplished it!